Our Star of the Month for January 2018 is Punita Bassi. Punita is a Senior Idsva at the Bristol Royal Infirmary, having built the service (which is based in the hospital’s A&E department) from the ground up six years ago. Support for victims of domestic abuse and sexual violence in a health setting is vital. We know 80% of people experiencing domestic abuse never call the police, so having professionals like Punita providing support in hospital means we can reach so many more people who need help. She has worked in the VAWG sector for 17 years, including developing policy within Kent and Surrey Police Authorities and delivering bespoke training to multi-agencies on risk assessment and risk management strategies around domestic abuse. 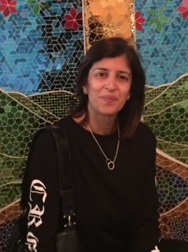 She delivers training for SafeLives on ‘honour’-based violence and forced marriage, and has also worked as guest lecturer at Bath Spa University, lecturing on gender-based violence in an international context. During our 16 Days campaign in December 2017, we had the privilege of shadowing Punita in the hospital. The service she runs is doing an amazing job of supporting vulnerable clients who may never have received an intervention if she wasn’t there – and it’s down to her hard work and tenacity that it’s been such a success. Do you know a professional who has gone above and beyond to change the response to domestic abuse and keep survivors and their families safe? Nominate someone for Star of the Month by emailing communications@safelives.org.uk with ‘Star of the Month’ as the subject line.